The one of the biggest ‘hangout’ would take place through 1000 tea stalls located across 300 cities. The locations are strategically chosen from all the constituencies where the party plans to contest elections. The campaign plans to have 10 rounds of tea-time discussion separated by an interval of 5 days each. 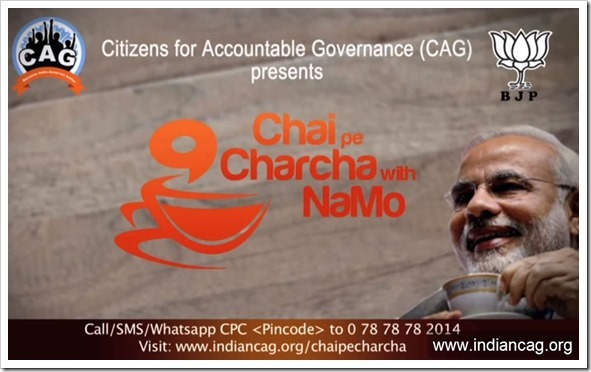 The ‘Chai pe Charcha’ campaign along with the ‘Statue of Unity, iron collection’ campaign will act as the 2014 version of the earlier public outreach programs like ‘Rath Yatra’. In my next post, I will cover the possible impact of this campaign on domestic tea sales. But it might take some time before I get all the necessary data. Keep checking this space for more.